Handmade wind or pinwheels are a nice decoration in summer for flower boxes, the entrance door or for the balcony or even a nice eye-catcher on a gift package. Mini pinwheels can be a colourful table decoration or even a funny idea for place cards. For children's birthday parties or summer festivals they can be nice invitations. 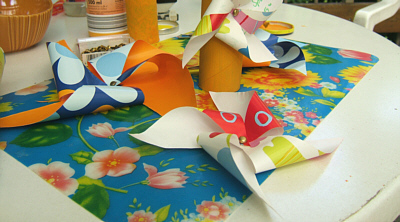 It is fairly easy to produce your own pinwheels. Cut the paper on the corners towards the middle. Drill a whole in the middle of the paper and attach with the help of nail and Co to the rod. 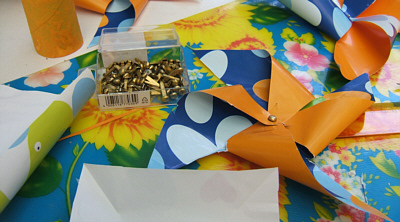 For the pinwheel you can use firmer gift paper or even a pretty decorative foil. If you want it more durable use oilcloth or the material used for plastic tablecloth. If you tinker with children best use thicker paper, this can be painted as liked.